Notes: Nothing too noteworthy on this one. 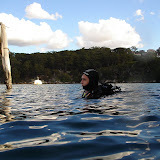 James was in town so we went for an easy dive. Got a bit cold towards the end… tempted again to get a hooded vest of some description (but then winter’s not that long in Sydney). For the first time in ages I didn’t mess up on batteries and had a functioning camera, but Chowder bay is a difficult place to get decent photos because of all the suspended matter in the water. The only decent ones are of James. Equipment: All own gear (24 lb weight). Rented 12.2 l steel tank from Plunge – generous airfill as always. Cleaning (well drying) the gear was easier with new BCD hangar and accessories hangar, bought cheap in NYC (check out the price of these in an Aussie dive shop and you’ll see what I mean).